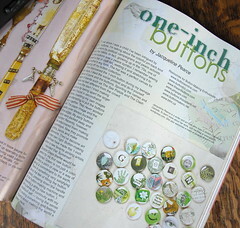 Here’s a glimpse of my one-inch button article (and buttons) featured in the new Jan/Feb issue of Somerset Studio magazine, and Hello! to any Somerset Studio readers popping by for a visit. It’s always nice to get something accepted by Somerset Studio, which is full of inspiring stamping and mixed media art examples and ideas. I made these buttons for the magazine’s “green” theme (you can see a close-up of a few of them in this August post), and in the process was reminded of the larger buttons I used to collect when I was a kid. When I was about age 10-12 I had two sides: my tomboy, rope-climbing, street-hockey playing side (the most visible), and my artist, craft-making, creative writing side (kept more to myself). To the right is a photo of me from that era (about 1974). I’m wearing a felt hat that I made by hand. I cut and sewed the felt (I think it was yellow), then wet it, stretched it over my mom’s wig form (everyone had a wig in the 1970s), and left it to dry into a head shape. This was my own invention, and I made more than one hat like this. I pinned my buttons to this one. Unfortunately, you can’t see the buttons very well in the old photo, and I can’t remember what they looked like. I think one had a peace sign and another had the words “flower power.” (My watch band embellishment was another home-made craft.) 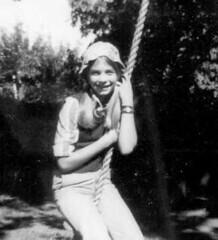 The rope swing was one my dad hung from a big maple tree in our backyard (there’s one still there today). If you like to make art from things found around you, check out the Olympia Dumpster Divers blog. Their January 1 post talks about making art from shoes and has a link to my shoes on the wires post. I don’t usually make specific New Year’s resolutions, but tend to set general goals like “create art,” “write,” “notice nature around me,” “nurture relationships,” etc. I also feel that the start of a new year is like the first page of a new diary: fresh, clean, ready for me to write whatever I want. Ever since I was a kid, I’ve kept a written diary or journal. Depending on the type of book, I used to fill several journals a year, but now I’m down to about one a year (if this still sounds like a lot of writing, you should know that I write big and messy and don’t get many words to a page). Every time I start a new book, I feel like it’s a fresh start in my life — like the start of a new year. I pause and think about what I want the theme of the new book/new year to be. It might be the year I move to Vancouver (1990), the year I get my first book published (2002), the year I travel to Japan (2006), etc. I’m not sure what the theme of this year will be. I have a few things I’d like to achieve in my personal life and in my writing, but the fact that we have to find a new place to live will be a big theme this year. I still don’t know when it will happen (some time within the next four months probably) or where we’ll end up, so I feel like I’m starting the year with an unseen page. Maybe 2008 will be a year of positive change. That’s what I’m hoping. I’ll leave off this post with an image of the moon on Christmas Eve (not in great focus, as I was balancing my little Nikon Coolpix on a balcony railing). 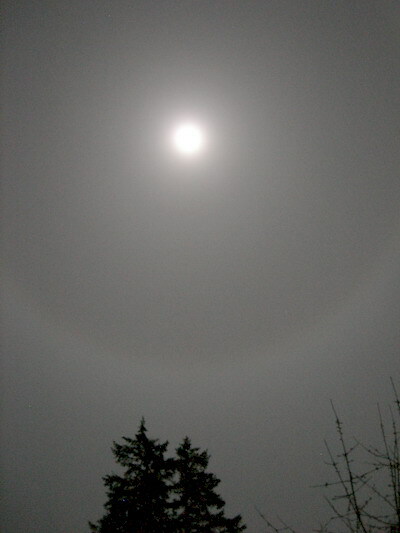 The huge halo around the moon is apparently due to the unusually close proximity of Mars (Mars was located to the right of the moon just within the halo).